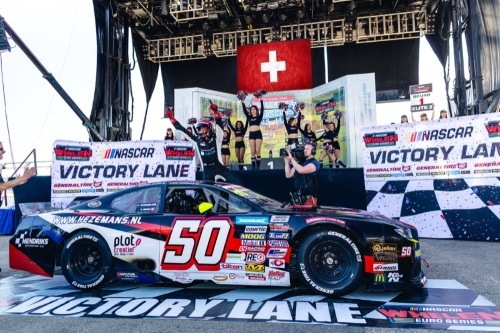 It was an exciting ELITE 2 Round 1 at the Circuit Ricardo Tormo and at the end of it, Giorgio Maggi (#50 Hendriks Motorsport Ford Mustang) went to Victory Lane in his first ever NASCAR Whelen Euro Series race. The Swiss driver was quick to avoid a crash in the very last corner of the race after a restart with two laps to go, picking up the second ever NWES win for Hendriks Motorsport. Maggi took advantage of the fierce battle between Andre Castro (#24 PK Carsport Chevrolet Camaro) and Myatt Snider (#48 Racing Engineering Ford Mustang). The two American drivers fought hard for the lead all race long and at the very last turn Snider made a move to overtake Castro for the lead. The attempt resulted in a contact which send both drivers spinning, giving Maggi the opportunity to sneak past the #24 and #48 to grab the checkered flag. 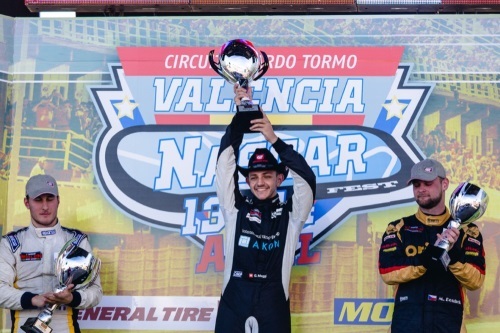 “I’m really happy to win here in my Euro NASCAR debut in Valencia,” said the 21-year-old race driver, who also won the Rookie Trophy. “I tried everything to catch those two guys in front of me, but in the end my goal was to save a little bit of tires. I managed to avoid crashing into them and got the win. Many thanks to Hendriks Motorsport for giving me such a great race car.” After starting twelfth, Vittorio Ghirelli (#9 Racers Motorsports Ford Mustang) completed a spectacular comeback and finished second, ahead of a solid Martin Doubek (#7 Hendriks Motorsport Ford Mustang), who gave another podium finish to Hendriks Motorsport. 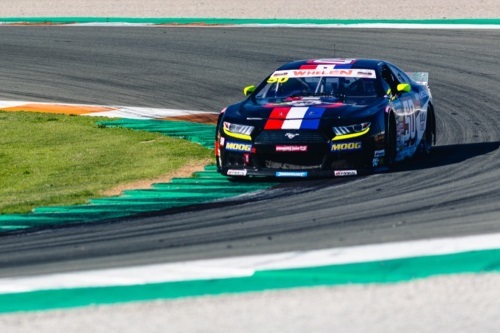 Massimiliano Lanza (#41 The Club Motorsport Chevrolet Camaro) won the battle for fourth, ahead of Dexwet-Df1 Racing driver Advait Deodhar (#66 Dexwet-Df1 Racing Chevrolet Camaro), who rounded out the top-5 and joined Maggi and Ghirelli at the Rookie Trophy podium. Scott Jeffs (#90 Braxx Racing Chevrolet Camaro) ended up sixth ahead of Pierluigi Veronesi (#27 Alex Caffi Motorsport Ford Mustang) and Mirco Schultis (#70 Mishumotors Chevrolet SS), who won the Legend Trophy. Sam Taheri (#31 CAAL Racing Chevrolet SS) and Michael Bleekemolen (#69 Team Bleekemolen Ford Mustang) closed the top-10. The Dutchman and Eric De Doncker (#98 Motorsport 98 Ford Mustang) completed the Legend Trophy podium. Arianna Casoli (#54 CAAL Racing Chevrolet SS) won the Lady Trophy by finishing 16th. Snider and Castro ended up 23rd and 24th after spinning in the last turn of the race and Snider received a 10 championship points penalty for causing an avoidable collision. The ELITE 2 Division will be back on track on Sunday at the famous Circuit Ricardo Tormo. The second round will start at 10:30 am CEST. 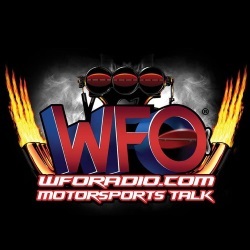 The race will be streamed live at Fanschoice.tv, the Euro NASCAR Youtube channel and Facebook page, Motorsport.tv and a vast of websites and social media pages around the world. 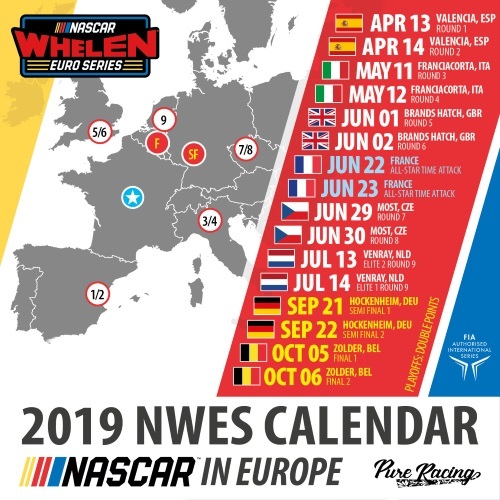 The NASCAR Whelen Euro Series was founded in 2008 and established the NASCAR official European Series in January 2012 thanks to a long-term partnership signed with NASCAR (National Association for Stock Car Auto Racing), Team FJ, a Motorsports company located in Blois, France, and Whelen Engineering as title sponsor of the Series.The season is made up of 24 races, equally split among ELITE 1 and ELITE 2 divisions, on the best European tracks. Euro NASCAR introduced a stunning innovation on July 7-8, 2012 by organizing the first ever NASCAR race on an oval track in Europe on a half-mile speedway built in the downtown of Tours (France). With four races in two days, these 400 HP V8 monsters provide pure racing action and thrilling bumper-to-bumper battles as well as a lot of family fun around the track! In the pure NASCAR tradition, race fans can get closer to the action than ever and feel the unique in Europe paddock atmosphere thanks to drivers, teams and cars always available for the spectators.The series attracts drivers from all over the world, all willing to fight on track for the win and take the first step towards becoming a NASCAR star in the U.S.